Stories Usually encapsulate new features or meatier initiatives. Some of our customers use them as mini projects. A good rule of thumb is if it requires more than one concrete step and/or requires more than one person to complete, it's a story. e.g. 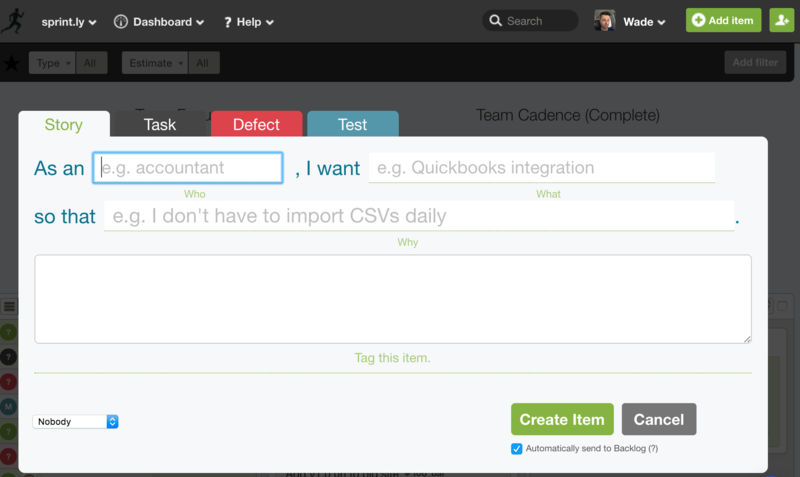 As an accountant, I want QuickBooks integration so that I don't have to download CSV files to import manually. Tasks Discrete units of work. e.g. Add field foo to table bar. Defects Things that aren't working that need to be fixed. Some customers also use these for maintenance tasks. e.g. The CSS isn't rendering correctly in IE6. Tests Any work related to QA, automated testing, and acceptance tests. e.g. Create a new Selenium test for the forgot password flow. Note: Stories are a special type of item. They can have sub-items. This means you can create an unlimited number of tasks, defects, and tests grouped under a story. Each sub-item can be individually assigned and gets its own item detail (permalink) page. To create a new item, click the big green plus sign at the top right of the header. Next you will want to choose an appropriate item type. Once you've selected a type and filled out the required fields, it would be a good idea to add a few tags to classify your new item. What should I use tags for? Tracking sprints/iterations Customers will tag things #sprint1, #sprint2, etc. There are two nice things about this approach: you don't have to move items between sprints when push to the next one and you have an audit trail of how many sprints an item took to complete. Tracking milestones At Sprint.ly we give major milestones code names and use tags to track them. Components, platforms, etc. Common tags in this space might be #api or #mobile. Trolling. Let's face it, what good is a collaboration tool if you can't use it to play practical jokes on coworkers? Who should I assign it to? If you're not sure who you should assign something to, assign it to a team lead or manager who can route the ticket appropriately. Where did my newly created item go? Most newly created items should go to Someday. You can get to Someday by selecting the Organizer from the header menu and selecting the Triage tab just below the filter bar. The title field of Tasks, Defects and Tests have a character limit of 255 characters. For Stories, each of the individual Who, What & Why fields have a limit of 255 characters. Click the gear icon and select Edit Item. Make your edits and click Update to save your changes. While in edit mode, you may have the option of changing the item type. Click on the new item type that you want it changed into and select Update. Since stories are unique in that they have sub-items, Stories cannot be changed into a task, defect or test.